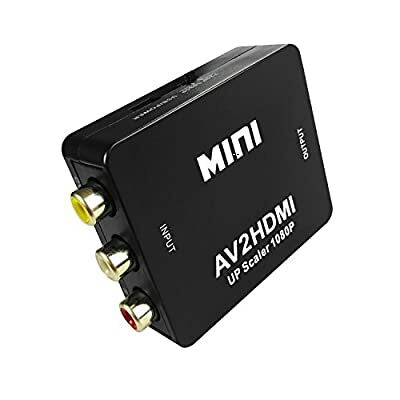 The Mini HDMI to AV /RCA signal converter can convert HDM video signal or audio signal to AV(CVBS)composite video signal and the FL/FR stereo audio signals, while support DVI system sideline signals. signal(standard-definition 480i,576i) to display on TV,VHS VCR,DVD recorders,etc. Compatible with PC Laptop Xbox Blue-Ray PS4 PS3 TV STB VHS VCR Comb Camera DVD Color Box, DVD recorders, etc. 2. Output the audio synchronization with video. 3. High bandwidth capability support 1920x1080@60Hz. 4. Support NTSC and PAL two standard TV formats output. Note: Video signal transfer only, can't improve the video quality, please import HD video. Personal or family: Connect high-definition player, DVD, set-top boxes, and PS3, XBOX360 Blu-ray machines and so on. Can be watched by the common old TV AV interface after converted. Important conferencing systems,can be used for display platform:After converted the HD HDMI signal of the HD camera by the converter, then through the acquisition card to a computer system to facilitate remote meetings transmission.